Land Destroyer: Cargill and Others Behind anti-Organic "Stanford Study"
Cargill and Others Behind anti-Organic "Stanford Study"
Anti-organic "study" is not news, rather, coordinated propaganda campaign. "Tomorrow, the baby is going to get an extra dollop of pesticide-sprayed carrots." Whether or not Wallop is as brain-addled as he leads on to being, the point of his editorial is to encourage similar attitudes amongst the Telegraph's readership, attempting to manipulate public perception in the wake of a recent Stanford University "study" regarding organic food. Image: Conflict of interest? Strange that Stanford University is partnered with agricultural giant Cargill and just so happens to come out with a study that suggests organic food is no better than its big-agri competition. According to Stanford University, Cargill has donated at least 5 million dollars for the creation of a Center on Food Security and the Environment (FSE). 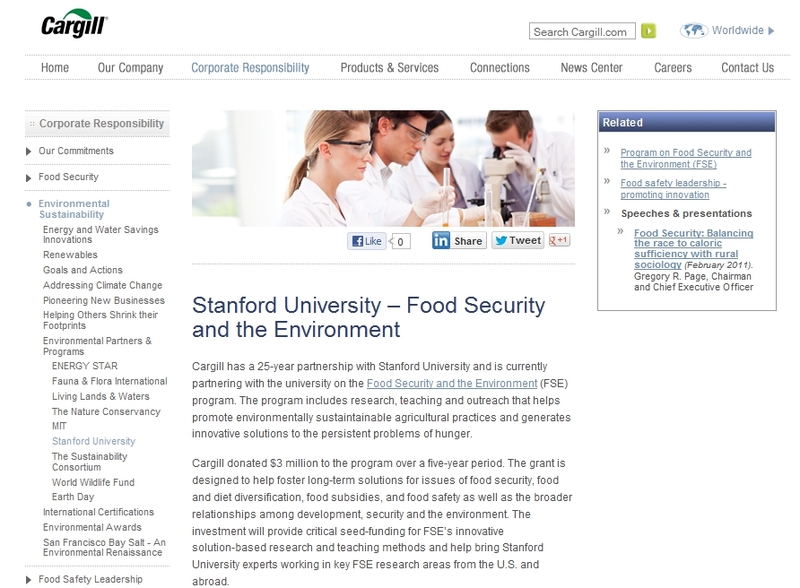 Cargill's website has a page describing its partnership with Stanford which can be found here. 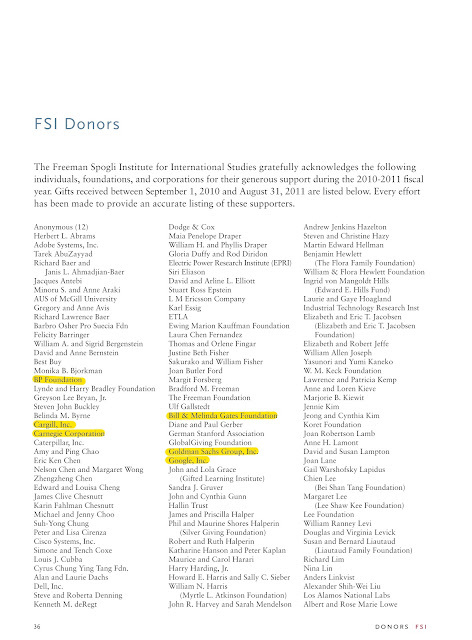 Cargill and many others also are listed as donors by Standford University in their 2011 Annual Report (page 38, .pdf). Whether or not readers of the Telegraph will put their own health and that of their children at risk for the sake of protecting big-agri's bottom line and the faltering paradigm that big-agri products are safe for human consumption simply because Harry Wallop thinks its good to feed his baby with pesticide-sprayed carrots remains to be seen. The London Telegraph, when not fabricating news to support England's latest imperial adventures overseas, is at the forefront of many of the largest corporate-financier funded lobbying campaigns. Recently, someone has splurged, and splurged big on anti-organic food lobbying built atop a suspect Stanford study. This most recent anti-organic food campaign began with a Stanford study (and here) out of its Center for Health Policy (a subsidiary of Stanford's Freeman Spogli Institute for International Studies), examining the nutritional value of organic food versus non-organic. Food with pesticides on it had nearly the same nutritional value, the study claims, as organic food - completely skipping over the whole point of eating organic. Indeed, the nutritional value would be similar - but the entire point of eating organic is not because of vastly superior nutritional value, but to avoid the "extras" included with products from big-agri corporations. "The Freeman Spogli Institute for International Studies (FSI) relies on support from its friends, as well as from national and international foundations and corporations, for the funding of the Institute's research, teaching and outreach activities." The Center for Health Policy is a subsidiary of the Freeman Spogli Institute for International Studies (FSI). So who are these "friends," national and international foundations and corporations funding the research of FSI and its subsidiary, the Stanford Center for Health Policy? 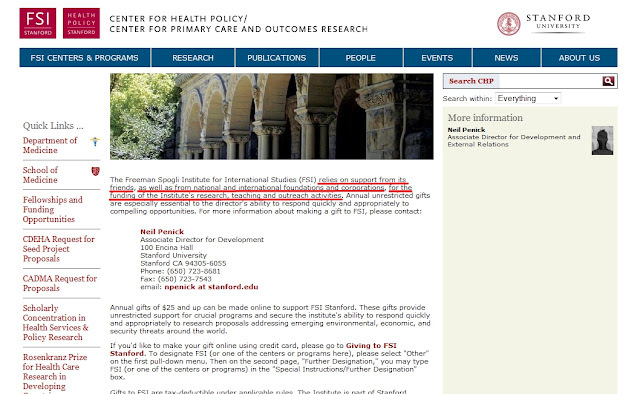 Image: From Stanford Center for Health Policy's own website it is admitted that " national and international foundations and corporations" fund its research and "outreach activities." This confirms the suspicions of an increasingly aware public who saw the "study" as biased, contradictory of both logic and ethics, and the result of insidious corporate-funding. According to FSI's 2011 Annual Report (page 38, .pdf) Agricultural giant Cargill, British Petroleum (BP), the Bill & Melinda Gates Foundation (heavily invested in both Cargill and big-agri giant Monsanto), the Ford Foundation, Google, Goldman Sachs, the Smith Richardson Foundation, and many other corporate-financier, Fortune 500 special interests. That none of this is mentioned, and the lack of independence and transparency involved in the study and its presentation to the public, overturns the credibility of both Stanford, and the Western media machine that so eagerly shoveled the results out to the public. Combined with the fact that the study itself is flawed, and the concerted, disingenuous nature with which it is being promoted to the public, a premeditated public relations campaign, bought and paid for by Stanford's FSI sponsors, most notably Cargill and the Bill & Melinda Gates Foundation is self-evident. Freedom and self-determination come from economic independence, self-reliance, and self-sufficiency. The most fundamental form of economic independence is having a safe, secure, and local food supply operated for, by, and of the people. Cementing this emerging paradigm, in spite of the crass, juvenile, even criminally irresponsible editorials like that of the Telegraph's Harry Wallop, and multimillion dollar "studies" subsidized by Cargill and the Bill & Melinda Gates Foundation, is the first step on extending this paradigm shift to other areas required for maintaining and advancing modern civilization.